Map of Long Beach and the Harbor District. 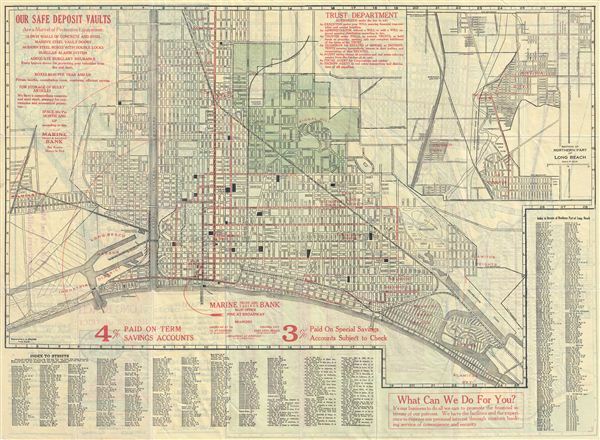 This is a beautiful 1925 map of Long Beach, California issued by the Marine Trust and Savings Bank. The folding map is printed on both sides. One side of the map features the map of Long Beach from Naples to Wilmington along with an inset of the Section of the Northern Part of Long Beach. An index in the lower part of the map lists the street names. Another index near the lower right quadrant lists the street in the Northern Part of Long Beach. The map is surrounded by advertisements by the Marine Trust and Savings Banks. extremely detailed, to the street level, important buildings are noted throughout along with locations of the Marine Trust and Savings Bank marked in red. Verso features the map of San Pedro and Wilmington along with an Auto Road Map of Southern California along with a street index and steamship companies listed. Once folded, the cover features a panoramic view of a section of the map noting various branch locations with an illustration of the Marine Bank. Map is engraved by L.L. Poates and presented by the Marine Trust and Savings Bank. Very good. Printed on both sides. Minor wear on original fold lines.